The Großarltal is a valley in the south of Salzburg, more specifically in the Pongau region. It is closely interconnected with the nearby Gasteinertal and its boosting tourism infrastructure. The Großarltal has two municipalities, Großarl itself and Hüttschlag (much smaller and less touristy), and is famous for plenty of sunshine due to its high altitude. During winter, skiing is obviously a very big deal for both communities; more than 6000 beds are available for international or domestic tourists that are attracted by reliably good snow conditions and the vicinity to the spas of the Gasteinertal. The Großarltal was linked to the Gasteinertal via the Skischaukel. The two valleys share many of their tourist facilities and marketing efforts since the early 1970ies. This has helped the Großarltal to develop tremendously and to leap from being a remote and backwarded village to one of Salzburg′s most modern skiing and hiking hubs. The Großarltal Area is part of the Ski Amade, one of the biggest skiing regions in Europe. For the summer season, the tourist information office of the Großarltal has come up with the name "Tal der Almen" (Valley of Mountain Cabins) to promote the Großarltal as one of the best valley in Austria for hiking and mountaineering ("hut hopping", so to speak). 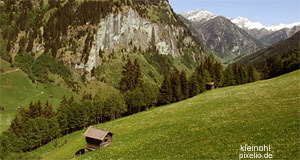 In fact, there are approximately 40 mountain cabins or Almen that are managed and open during the summer season. For a valley of the size of the Großarltal, that is quite a lot. In addition, there are some 250 kilometres of hiking paths and 80 kilometres of designated routes for mountain bikes. Other selling points include the usual suspects: Spa holidays, various alpine sports and day-trips to scenic spots in the National Park Hohe Tauern. The tourist information board operates a taxi service that picks up people from there hotels to deliver them to the starting points of the most scenic hiking routes. Many cable-cars of the Großarl-Dorfgastein skiing area and the famous Skischaukel operate during the summer season to take hikers to altitudes of up to almost 2000 metres. The highest mountain of the Großarltal is the Kesskogel in Hüttau with 2,884 metres.